Rained out again today. So I'm watching PBS and came across a show called Iowa Herbs. After that, I made an omelet with herbs from my garden tote herb garden. Yum. 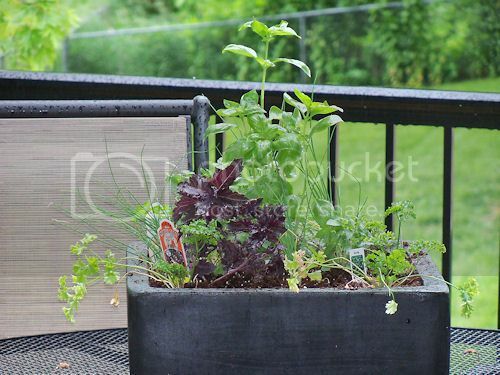 That triggered the idea to transfer the herbs to a bigger container and place it on the deck. So that's exactly what I did today! Transferred what I had, and bought a few new things. The larger pot will help a lot. I love your pot of herbs. Isn't it funny how a programme can spur you on? I'll bet that herb omellete was delicious with all your fresh herbs in it.